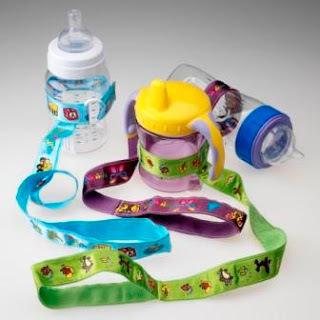 NoThrow®, a product of Twin Beginnings, LLC, was developed by identical twin sisters Karla Scanlan and Karen Kuhn as a solution to keep bottles and sippy cups in place. 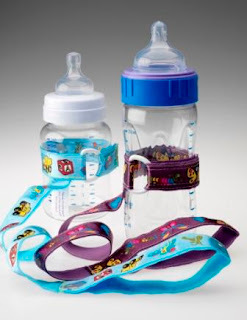 The product, a unique tether and Velcro strap, connects to a child’s bottle/cup to prevent the cup from being thrown. The twins came up with the idea for NoThrow after Karla and her family relocated from Chicago to suburban Detroit. As a result of the move, the sisters found themselves traveling back and forth between the two states much more than they ever imagined. One frustrating day, Karla was on an airplane chasing her son’s rolling baby bottle under passenger seats while her twin sister Karen was driving long-distance on an expressway and pulling over every ten minutes to pick up her baby’s sippy cup to stop his crying. That very night, when Karla and Karen relayed their hectic day, they decided they were going to come up with a solution. It was then that Karla and Karen became mothers of invention. They borrowed sewing machines and designed a product that would link their child’s bottle or sippy cup to a stroller, highchair, car seat, airplane seat, bicycle seat, or just about anything! They named it "NoThrow." NoThrow can be found at Walgreens locations throughout the country, select baby boutiques, grocery stores such as Publix and online at www.nothrow.com. Required entry: Go to the No Throw's website and tell me your favorite pattern, then come back here and enter the name of your fave in the form below. Extra entries are outlined in the form. This giveaway is open to all residents of US and Canada. Be sure to enter the giveaways at Moody Mama Says and Everyday Baby Steps! Thank you for stopping by and if you enter, Good luck!